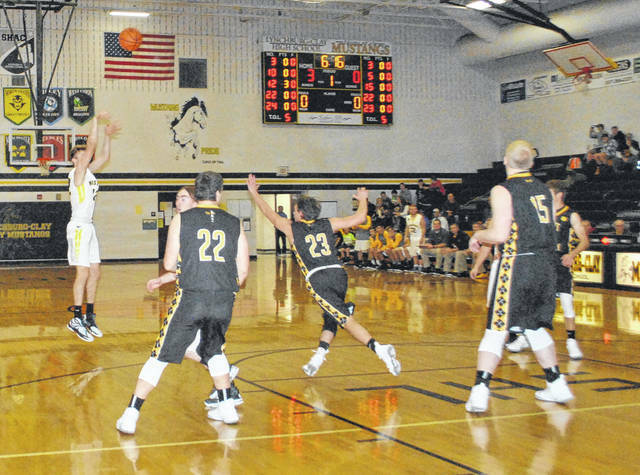 Eric McLaughlin shoots a jumper against the Paint Valley Bearcats at Lynchburg-Clay High School. McLaughlin was named to the Third team All-Ohio in Division III on Monday by the OPSWA. The Division I and II boys basketball All-Ohio teams were announced Tuesday by a statewide media panel. The teams were selected by members of the Ohio Prep Sportswriters Association. Dane Goodwin, Upper Arlington, 6-foot-5, sr., 23.5 ppg; Jerome Hunter, Pickerington North, 6-7, sr., 21.0; Sincere Carry, Solon, 6-0, sr., 23.2; Alonzo Gaffney, Garfield Heights, 6-9, jr., 18.2; Jaret Pallotta, Massillon Jackson, 6-6, sr., 15.5; Mason McMurray, Stow-Munroe Falls, 6-8, sr., 14.6; Vincent Williams, Toledo St. John’s, 6-5, sr., 18.9; Darius Bazley, Cincinnati Princeton, 6-9, sr., 15.3; Jaxson Hayes, Cin. Moeller, 6-10, sr., 12.0; Darius Quisenberry, Huber Heights Wayne, 6-1, sr., 18.5. PLAYER OF THE YEAR — Dane Goodwin, Upper Arlington. COACH OF THE YEAR — Brett Norris, Hilliard Bradley. JT Shumate, Newark, 6-6, sr., 21.2; Treauhn Williams, Reynoldsburg, 6-7, sr., 18.0; Ben Roderick, Olentangy Liberty, 6-5, sr., 24.3; Dale Bonner, Shaker Heights, 6-3, sr., 18.4; Christian Guess, Shaker Heights, 6-6, sr., 26.2; Collen Gurley, Akron Hoban, 6-2, sr., 15.2; Houston King, Toledo St. John’s, 6-4, sr., 17.0; Jackie Harris, Toledo St. Francis, 6-6, jr., 16.5; Bo Myers, Logan, 6-5, jr., 22.0; RaHeim Moss, Springfield, 6-4, jr., 16.2. Jake McLoughlin, Dresden Tri-Valley, 6-6, sr., 12.2; VonCameron Davis, Columbus Walnut Ridge, 6-4, soph, 22.8; Devon Grant, Lorain, 6-1, jr., 21.0; Kaleb Martin, Green, 5-9, jr., 19.0; Delmar Moore, Warren Harding, 6-6, sr., 13.0; Kyle Jackson, Mansfield Madison, 6-6, sr., 20.3; Alek West, Sylvania Northview, 6-3, jr., 14.5; Branden Maughmer, Chillicothe, 6-2, Sr., 17.4; Samari Curtis, Xenia, 6-4, jr., 30.4; Jeremiah Davenport, Cincinnati Archbishop Moeller, 6-5, sr., 15.4. PLAYER OF THE YEAR — Pete Nance, Richfield Revere. COACH OF THE YEAR — Chad Burt, Wauseon. Chase Yoho, Bellaire, 5-10, sr., 25.6 ppg; Danny Bartholomew, Magnolia Sandy Valley, 6-8, sr., 17.9; Tre’ Baumgardner, Columbus Africentric, 6-0, sr. 17.0; Christopher Anthony, Canal Winchester Harvest Prep, 6-0, soph., 20.2; Jordan Burge, Cleveland Heights Lutheran East, 6-3, sr., 18.6; Jay Kaufman, Ottawa-Glandorf, sr., 6-5, 18.6; Dylan Swingle, Bainbridge Paint Valley, 6-11, sr., 23.1; Tanner Holden, Wheelersburg, 6-6, jr., 17.6; Justin Ahrens, Versailles, 6-6, sr., 25.3; Ryan Rose, Tipp City Bethel, 6-2, sr., 22.3. PLAYER OF THE YEAR — Justin Ahrens, Versailles. COACH OF THE YEAR — Nate Barhorst, Anna. Cal Kildow, Belmont Union Local, 5-9, jr., 17.7; Solomon Pierre-Louis, Columbus Wellington, 6-3, sr., 16.0; Claudio Penha, Canal Winchester Harvest Prep, 6-6, sr. 19.5; Gabe Walker, Wooster Triway, 6-3, sr., 21.8; JoJo France, Akron Manchester, 5-8, sr., 19.4; Dorian Crutcher, Elyria Catholic, 6-4, sr., 23.2; Maxwell Joppeck, Wellington, 6-5, sr., 23.7; Bryce Williams, Archbold, 6-3, sr., 13.9; Tanner Perdue, Piketon, 6-2, sr., 24.5; Wyatt Bensman, Anna, 6-2, sr., 16.5. Trey Smith, Cin. Country Day, 6-2, sr., 19.6; Drake Novak, Rayland Buckeye Local 6-1, sr., 25.1; Chanc Dawson, Columbus Ready, 6-4, sr., 18.4; Jacob Reed, Smithville, 6-4 sr., 17.8; Lukas Swartz, Mogadore, 5-11, soph., 20.5; Drake Batcho, Warren Champion, 6-4, sr., 21.6; Tyler Stephens, Leavittsburg LaBrae, 6-5, jr., 18.0; Josh Borling, Columbia Station Columbia, 6-6, sr., 17.3; Jacob Plantz, Genoa, 6-3, jr., 21.0; Eric McLaughlin, Lynchburg-Clay, 6-6, sr., 19.7. Lukas Isaly, Hannibal River, 5-11, sr., 24.4; Mark Mayle, Malvern, 6-9, sr., 19.8; Michael Bothwell, Cornerstone Christian Academy, 6-3, Sr., 24.6; Trey Brooks, Elyria Open Door Christian, 6-4, jr., 21.0; Kaleb Bauman, Rittman, 6-2, sr., 17.4; Byron Taylor, Warren John F. Kennedy, 5-10, sr., 25.5; Jared Jakubick, Mansfield St. Peter’s, 6-4, sr., 24.6; Randy Hixson, Glouster Trimble, 5-9, sr., 25.4; Dillon Braun, Fort Loramie, 6-1, sr., 16.5; Ethan Conley, Arcanum Franklin Monroe, 6-3, jr., 22.6. PLAYER OF THE YEAR — Michael Bothwell, Willoughby Cornerstone Christian. COACH OF THE YEAR — Chad Bever, Rittman. 22.6; Scott Troyer, Berlin Hiland, 5-10, sr., 13.9; Skyler Durbin, Danville, 6-3, sr., 22.9; Zane Purvis, Millersport, 5-10, sr., 20.0; Devan Yarber, Oberlin, 5-11, sr., 14.3; Braedon Poole, McDonald, 6-5, sr., 26.0; Drew Johnson, Pandora-Gilboa, 6-6, sr., 17.8; Javin Etzler, Convoy Crestview, 6-7, jr., 15.2; Justin Sweeney, Lisbon David Anderson, 6-0, jr., 25.1.
https://www.timesgazette.com/wp-content/uploads/sites/33/2018/03/web1_McLaughlin-Jumper.jpgEric McLaughlin shoots a jumper against the Paint Valley Bearcats at Lynchburg-Clay High School. McLaughlin was named to the Third team All-Ohio in Division III on Monday by the OPSWA.